Previously, on MinerBumping... A fleet of two dozen bumpers headed to Gallente space to move into our new vacation home, the Tolle system. The new regime's display of power impressed the miners. It didn't take the miners long to realize who was in charge. I could tell Vallard en Bauldry couldn't speak English fluently, so I was patient with him. Yet he had difficulty gathering the necessary funds, and was kept out of the ice field. Clearly, he was giving me the runaround. Every miner is deemed to have a net worth of more than 10 million isk. If not, they can sell their mining ship to purchase a permit from me, and mine in a rookie ship until they can make up the difference. 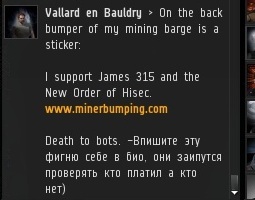 Vallard was encouraging his fellow Russian miners to put loyalty oaths into their bios, without paying the required 10 million isk. Vallard and another miner quickly pledged loyalty. 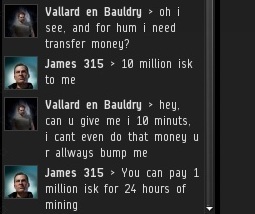 I had always assumed the stubborn miners would sooner pay 10 million isk than post an oath in their bios, therefore making it unlikely anyone would fake it. But Russian culture is different, it would seem. 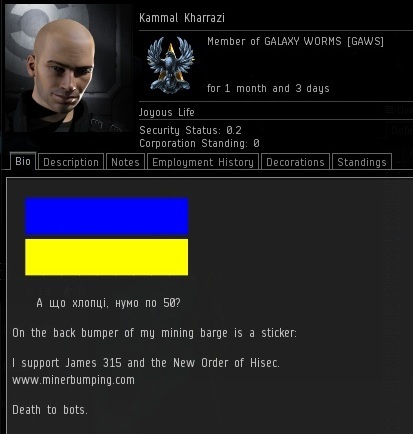 Yet another ice miner, Kammal Kharrazi, swore fealty to me and the New Order in his bio, which also contained the Ukranian flag. Some of my Agents were not amused by these acts of deception, but I found it hilarious. Airon's bio had gone viral! Still, they were violating the Code. The lot of them were Red Penned and removed from the ice field. The rest of the ice miners did not display such originality, I'm afraid. 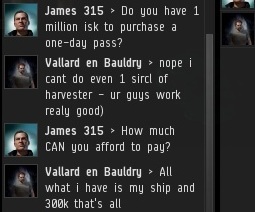 Gallente highsec miners behaved no differently than all the miners we encountered in the past. 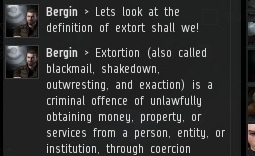 Bergin's copy-pasta of the definition of extortion deserves its own sub-square on the Miner Bingo square for "extortion", I have seen it so many times. There is nothing cult-like about the New Order, except maybe for the whole "charismatic leader" thing. Come to think of it, saying I run a cult is almost a backhanded compliment. Miners docked up. They were unwilling to swallow their pride by either paying the 10 million or retreating to another system. So they sat around and griped about us. 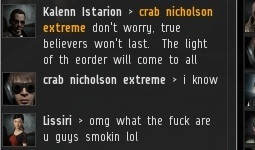 ...Except for one miner, crab nicholson extreme. Having purchased his permit, he mined freely while watching all the other miners get bumped out of the ice field. Peace and order had come to Tolle, even if it was only temporary. The battle continues! Tolle remains our vacation home until further notice. Welcome to Tolle. As one of the Ice Miners living in the system, I welcome you with open arms. Please keep the bots and AFK-Miners out of our beautiful Ice Fields. They do not belong in the beautiful Ice Fields of High-sec. Strange thing about extortion. It's on the opposite side of the spectrum from "compliance". Which the Code insists on.